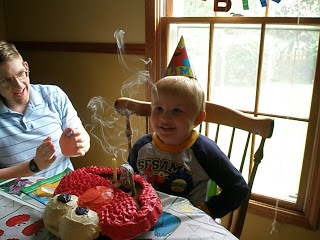 Goofy is turning 3! 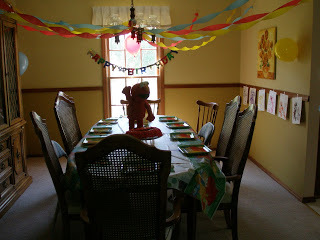 He is a BIG Elmo fan so the theme was easy to decide! At this point we usually just invite family & he is the oldest cousin. The other kiddos are all 1-4 months old so no games for just Goofy. We put up streamers, go the matching table cloth & paper plates, and I hung pictures on the wall that he had colored of Elmo. Our precious boy! 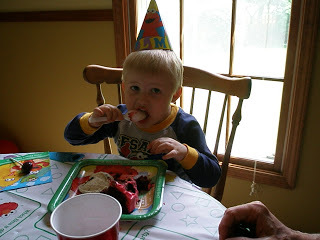 Can he really be 3 already?!?!? I used Elmo cake pan and piped the frosting to make the red look like fur. 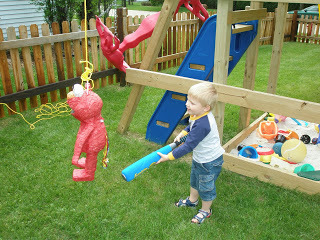 He LOVED his Elmo Pinata. 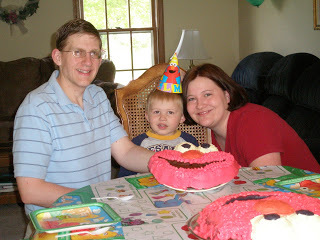 We were a little afraid he wouldn’t want to ‘hit’ Elmo, but the idea of candy & surprises inside convinced him!